The Explore Lompoc presents 805 Criterium Weekend kicked off on Friday evening with a twilight criterium on a nice banked 1.3 mile course. This year they put in a nice twist and reversed the courses from previous years which made it fast and hard. The Pro 1/2 race kicked off at 6:45 pm with the wind blowing hard which would make it a hard 90 minutes. Attacks were going off the front from the gun and about 15 minutes in, the first real breakaway got a nice 20 second gap of five riders. Shortly after that I made a serious attack and crossed over to the breakaway with one rider who joined me. The group worked well together but it was short lived and the group came up a few laps later. At 40 minutes the first four riders of the winning breakaway got a 25 second gap on the field and with one of the race favorites, Brandon Gritters (Rock ‘n Road Cyclery), getting in that breakaway it made other riders want to cross over. A few laps later, myself and four other riders got away from the field and quickly started working well to try bridge the gap to the front four riders. It took some time for our group of five to get across, but with about 25 minutes to go we managed to make the bridge which made it a breakaway of nine riders. All nine guys really went full out to hold off the field. The breakaway started building up a substantial lead over the field and with two laps to go Brandon Gritters (Rock ‘n Road Cyclery) put in a serious solo attack, but the other eight riders in the break weren’t going to give up that easy and kept the pace up. With the bell lap we managed to lap the field which changed things a lot and meant we would now have a field sprint for the line. In the last lap there was a lot of confusion and jockeying for position, but in the end Garrett Hankins (Team Mike’s Bikes p/b Equator Coffees) took the win and I finished 5th on the day, which I was happy about and made it a good start to the weekend. The second day of 805 Criterium Weekend was on a technical course and with the wind blowing heavily it would be a seriously tough day of racing. The SoCalCycling.com Team had three riders today with Wesley Eslick, Josh Ruiz and Steven Davis, which was good as we could work well together to try get another good result on the day. The race started off with all cylinders firing and lots of strong attacks going off the front. Early on, a split of seven riders got off the front with Josh Ruiz (SoCalCycling.com Team) crossing over along with Brandon Gritters (Rock ‘n Road Cylery) soon after. The field was splitting into pieces on the back straight as the wind was blowing heavily. The breakaway of ten riders soon built themselves a half lap gap and with all of the teams represented the field wasn’t really chasing too hard. About halfway through, the breakaway lapped the field and we were all back together again. Paul Morris (TEAM CLIF BAR Cycling) wanted to keep that breakaway going so he was straight at the front again putting the pressure on with Josh (SoCalCycling.com Team) covering him. Lots of attacks kept going off the front but nothing was getting away. Steven Davis (SoCalCycling.com Team) and myself were marking moves, but hats off to Steven for the amount of controlling he did to try take the pressure off Josh and myself and put us in a good position for the final sprint. With one lap to go the field was strung out, but with three corners to go there was a big crash which took Josh out along with some Clif Bar riders. I managed to just get through and into the last corner another rider just went in too hot and rode into the barrier. 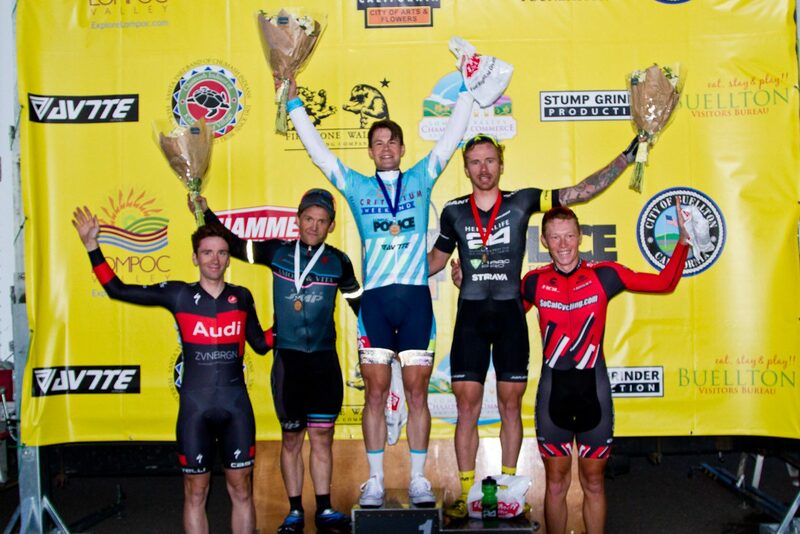 Willie Myers (Herbalife p/b Marc Pro – Strava) won the stage with Paul Morris (TEAM CLIF BAR Cycling) in 2nd and Brandon Gritters (Rock ‘n Road Cyclery) in 3rd. Josh got himself up and still crossed the line one lap up for 8th place. I managed 14th on the day and Steven was 21st and overall it was a good Team effort! Yesterday was the closing day of the 805 Criterium Weekend and the nice hard technical course awaiting the riders made for a good day of racing. The race started off fast from the gun with lots of riders trying to attack off the front of the main field but nothing was getting away. After around 25 minutes there was a points prime for the first three riders across the line. With the bell for the prime lap there was a lot of jockeying for position in the field, but I managed to get myself 3rd to pick up one point towards the GC. Shortly after the prime, Brandon Gritters (Rock ‘n Road Cyclery) put in a big attack and only one other rider, Logan Loader (Amore e Vita – Selle SMP), followed him. The field was very hesitant to chase the move, but soon a group of five riders got off the front and I was sure they would make the bridge over to the front two riders, but that was short lived as they got brought back into the pack. Team Clif Bar went to the front and started controlling the race to try bring the gap back down and they were setting a good solid pace. With five laps to go, the front two riders had a half lap gap over the field and it was sure that we were now racing for 3rd on the day. With the bell lap the field was racing at a high speed with a lot of bumping and action going on in the front. I played a low profile along with my teammate Steven Davis by sitting back around mid pack. With half a lap to go, Steven did well to put me in a good position for the sprint, but with two corners to go I went a little wide and had to put on the brakes which cost me a few places that I wasn’t able to make up in the final sprint. I ended the day with 15th place on the stage and 8th in the overall GC. Thanks to Steven for keeping me protected all day and his work he did for me on the stage! The 805 Criterium Weekend was very well organized and I will definitely be back next year for it! Thanks again to all our SoCalCycling.com Sponsors as well, as without them this wouldn’t be possible – SoCalCycling.com – Your Cycling Source, Cannondale Bicycles, Sugoi Performance Apparel, FULL SPEED AHEAD, Pacific Premier Bank, ROL Wheels, Clif Bar, fi’zi:k, Echelon Design, Incycle Bicycles, Continental Tire, KMC Chain, TRP Brakes, Larsen’s Restaurants, Complex Ink and the Ontario Police Officers’ Association.